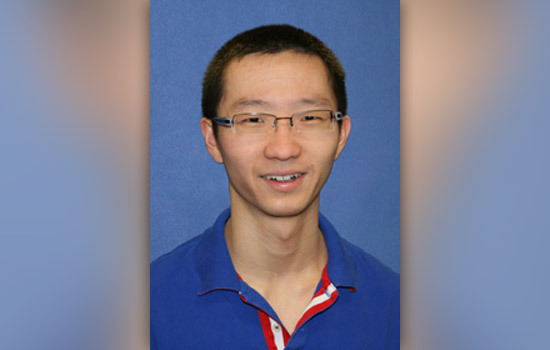 Hao Shi, a 2013 graduate of Rochester Institute of Technology’s physics program, was chosen as a recipient of the American Physical Society’s LeRoy Apker Award. The premier national award recognizes outstanding achievement in physics by an undergraduate student in the United States. The American Physical Society presents the annual award worth $5,000 to two students: one from a Ph.D.-granting institution and another from a non-Ph.D. granting institution. The society will recognize Shi’s undergraduate research from RIT’s non-Ph.D. granting program, and the work of Guy Geyer Marcus, the recipient from Wesleyan University’s Ph.D. granting program, during a ceremony at the society meeting in Madison, Wis., slated for June 2­­–6, 2014. As Shi’s nominating department, RIT’s School of Physics and Astronomy will also receive a certificate and $5,000 to support undergraduate research. The Apker Award recognizes Shi’s undergraduate research in theoretical quantum and optical physics, and cites his work on “Torsional Optomechanics: A Dialogue Between Spinning Photons and Twisting Oscillators.” Shi explored the quantum dynamics of optomechanical systems with his RIT research adviser and mentor, professor Mishkat Bhattacharya, and his secondary mentor, professor Edwin Hach III. Shi submitted five papers during his undergraduate career at RIT. He was the first author on papers published in the Physical Review A, Journal of Modern Optics, and the Journal of Physics B, a co-author on a paper published in the American Journal of Physics and a co-author on a paper submitted to the Journal of the Optical Society of America A. Hao is currently pursuing his Ph.D. in physics at Cornell University. The research performed by Shi and Bhattacharya was partially supported by a grant from the Research Corporation for Science Advancement. Shi is originally from Xiamen, China. In 1978, Jean Dickey Apker established the LeRoy Apker Award in the memory of her husband and colleague. Apker was an experimental physicist at General Electric Research Laboratory known for his research on the photoelectric effect in semiconductors and the photoelectric properties of potassium iodide.